Fuel Cell Electric Vehicle Market size valued at over USD 830 million in 2018 and is estimated to exhibit over 42% CAGR from 2019 to 2025. Increasing awareness towards deteriorating air quality and excessive noise from public and private transportation are driving the fuel cell electric vehicle market size over the forecast period. FCEV holds a significant potential in reducing emissions while meeting operational requirements. Several government entities are taking initiatives such as tax credits and favourable incentives to encourage the adoption of zero emission automobiles. For instance, in July 2018, the Ministry of Trade, Industry, and Energy (MTIE) proposed a target of deploying five million zero emission vehicles by 2030. Significant environmental benefits in addition to zero emissions will enhance the fuel cell electric vehicle market demand. Hydrogen holds substantial potential for carbon neutrality along the entire value chain. The gas can be produced from 100% renewable energy sources using electricity ensuring zero carbon dioxide emission during vehicle operation. According to the Fuel Cells and Hydrogen (FCH) Organization, a standard fuel cell bus can save approximately 800 tonnes of CO2 in 12 years compared to buses operating on conventional fuels. Rapid technological advancements in fuel cell stacks are significantly contributing towards reducing the overall vehicle cost and increasing efficiency considerably. Long term strategies and undertakings by the European Union including the Hydrogen and Fuel Cell Technology Platform along with Fuel Cells and Hydrogen Joint Undertaking (FCH JU) are encouraging continuous R&D activities in the fuel cell industry. Development of high-density hydrogen storage systems for transportation applications along with the introduction of vehicles across multiple segments are providing a positive outlook for the fuel cell electric vehicle market expansion. Supportive government funding in conjunction with strategic collaborations for the development of hydrogen refueling infrastructure are propelling the fuel cell electric vehicles market growth. For instance, in October 2017, Al Futtaim Motors collaborated with Air Liquide to deploy hydrogen refueling stations in Dubai. Provision for easily accessible fuelling stations at residential buildings and public places along with lower refueling time will positively influence the market expansion over the projected timeframe. 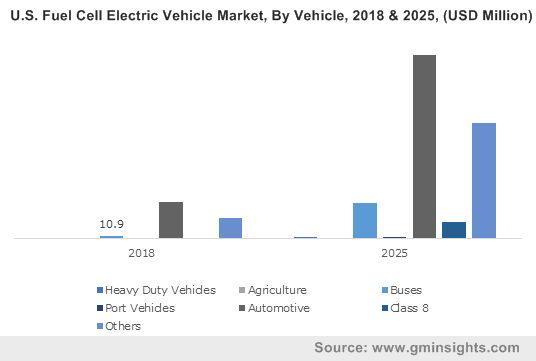 Increasing demand for enhanced mobility catering to industrial and freight transportation is providing a positive outlook for the fuel cell electric vehicle market share expansion over the study timeframe. Industry players are continuously involved in incorporating zero emission vehicles in their plants and factories for reducing carbon emissions significantly. For instance, in March 2018, Toyota Motor Corporation announced the deployment of 20 new zero emission forklifts in its Motomachi plant for reducing carbon emissions significantly. Higher investments required for establishing hydrogen fuelling infrastructure may restrict the market demand. The lack of a proper refueling stations networks along with the easier availability of traditional fuels including gasoline and diesel may attract customers to adopt traditional vehicles and further limit the market size over the study timeframe. However, industry participants along with multiple government organisations are continuously investing for expanding the fuel station networks. For instance, in 2018, Shell and Toyota were awarded a contract amounting to USD 8 million by the California Energy Commission (CEC) for developing hydrogen-truck refueling stations in the U.S. Automotive fuel cell electric vehicles grew significantly at over 50% over the projected timeframe. This can be attributed to the supporting incentives and policies from government organisations to increase adoption of such vehicles. Additionally, industry players are introducing a wider range of vehicles to target a diversified customer base. For instance, in 2018, Hyundai unveiled its first fuel cell vehicle named the Nexo with around 500 miles of driving range. Buses accounted for around 2% volume share in 2018. This is attributed to the lower noise, harshness and vibrations (NHV), coupled with no emissions from such vehicles. The requirement for travelling over long distances along with reduced refueling time are supporting the segment expansion. Supporting government policies for replacing traditional fuelled public transportation for lowering greenhouse gases emissions along with lowering dependency on conventional fuels will further expand the fuel cell electric vehicle market growth over the study timeframe. For instance, in 2017, the European Commission launched the Joint Initiative for hydrogen Vehicles across Europe (JIVE) project for the deployment of buses for public usage across Europe. 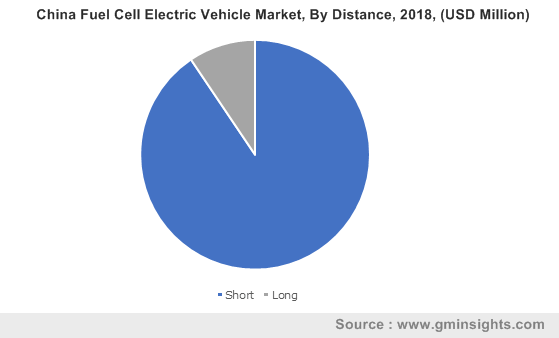 In 2018, short distance dominated the fuel cell electric vehicle market. This can be credited to the increasing consumer inclination towards zero emission vehicles coupled with rising spending power. Easier availability of leasing facilities from manufacturers are encouraging the adoption of fuel cell automobiles. Rising preference for feasible modes of transportation offering ease of operation in high traffic areas is accelerating the e-bikes demand. Additionally, fuel cell electric forklifts are showcasing significant growth opportunities owing to space efficient and environment friendly means of material handling transportation. The long-distance segment accounted for significant share in 2018. This can be attributed to the increasing focus of automobile OEMs for introducing a diversified portfolio of hydrogen fuel cell powered and conventional fuelled vehicles. Additionally, the limited availability of hydrogen refueling stations are enabling manufacturers to invest in long driving range technologies for attracting customers, thereby escalating the fuel cell electric vehicle market share. For instance, in 2017, Toyota unveiled its ‘Fine-Comfort Ride’ vehicle based on hydrogen fuel cell technology with a driving range of around 620 miles. 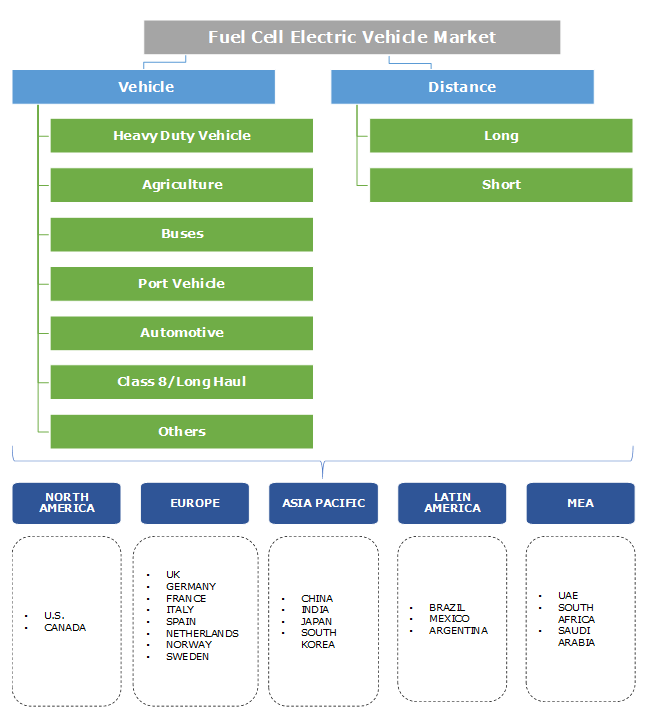 North America leads the fuel cell electric vehicles market with presence of supporting infrastructure and multiple automobile manufacturers. Government organizations are taking initiatives and offering a wide range of incentives and policies to boost FCEV adoption. For instance, the Connecticut government announced a rebate of around USD 5,000 for purchasing fuel cell electric vehicles. Further, in 2017, California Air Resources Board (CARB) announced to construct over 90 hydrogen stations to drive the FCEV market demand. 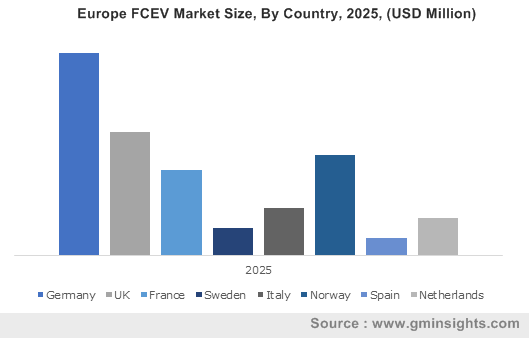 Europe fuel cell electric vehicle market share will witness steady growth owing to stringent regulations associated with carbon emissions. Industry players across the region are committed towards development of low cost, heavy, and light commercial vehicles. Government entities such as Fuel Cells and Hydrogen Joint Undertaking (FCH JU) are committed towards reducing the overall development cost by 40% - 46% till 2030. Further, ongoing projects such as JIVE & JIVE 2 are working along with vehicle manufacturers to deploy FCEVs and development of refuelling infrastructure. Major fuel cell electric vehicle manufacturers include Toyota Motor Corporation, Honda Motor Co. Ltd, Hyundai Motor Group, Audi AG, Volkswagen, SAIC Motor Corporation Limited. Key industry participants involved in manufacturing fuel cell systems include Nuvera Fuel Cells LLC., Ballard Power Systems, Meritor, Inc., US Hybrid, Hydrogenics, Dana Limited, Plug Power Inc and Sunrise Power. Hydrogen powered vehicle manufacturers are aiming to increase their production volumes to support the rising demand for fuel cell electric mobility vehicles. Industry participants are emphasizing on developing innovative technologies and solutions for strengthening their market share. Strategic partnerships and collaborations are significantly contributing towards increasing revenue generation and expanding their global reach. For instance, in May 2018, BYD entered into a strategic partnership with BYD Motors Inc. for developing hydrogen fuel cell powered buses. Regulatory authorities are focusing on reducing pollution levels by enforcing stringent emission norms and regulations for respective vehicle segments. The U.S. Federal emission standards pertaining with vehicles and engines are specified by the U.S. Environmental Protection Agency (EPA). Incentives and technological advancements in fuel cell vehicles are attracting customers to opt for such vehicles owing to their multiple benefits, thereby providing a positive outlook for the fuel cell electric vehicle market expansion.